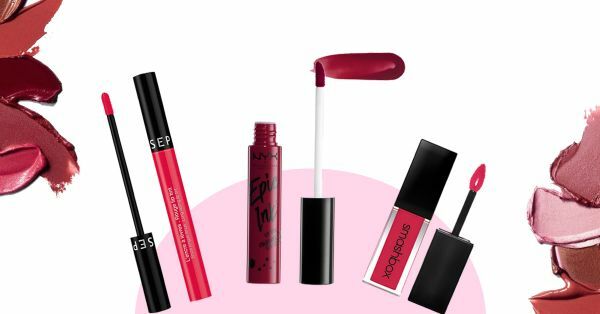 Your beauty arsenal for Valentine’s Day is incomplete without some kiss-proof lipsticks! And plus it's International Kiss Day! We want you to get cosy and steal a lot of kisses this year. Don’t want to end up with a face full of lipstick though! Picking the right lipstick formula is *key*. The right lipstick won’t smudge, smear or budge through the heat of the night. Check out some of these long-lasting lipstick formulas that won’t leave you looking like a hot mess! These lipsticks are going to stand the test of your wine and dine! So pucker up and steal as many kisses as you can, after all this is the most romantic night of the year! PS: A lip stain or a SOLID liquid lipstick is your best friend for this night of the year. A really great liquid lipstick may flake but it certainly won’t smear. A lip stain as the name suggests stains your lips. Lip stains have a watery consistency and are extremely pigment-rich. A little goes a long way and they leave your lips with a gorgeous stain. For I-woke-up-like-this lips, use a lip stain! Oh and did we mention, some of them taste AMAZING too! The NYX Epic Ink Lip Dye coats your lips with a rich, pigmented, dramatic stain. The lightweight formula sinks right in and dries down matte finish. Since this one’s a lip stain, it won’t give you dry, chapped lips! You can slay this lipstick alone or wear it under your favourite lippie to give it a boost of colour. The LASplash lipstick is a velvet matte finish liquid lipstick that’ll stay put come rain or shine! I personally own a few and they’re one of the most long-wearing formulas I’ve seen. They do tend to dry out your lips so a good lip balm and a lip exfoliator are needed at the end of the day. If you need a kickass lipstick that won't transfer, smudge or fade - get this one! Oh and you’ll need an oil-based make-up remover to get this one off! If you’ve ever been a fan of M.A.C’s Retro Matte Lipsticks, these are the same only in a liquid finish. These babies will stay put for 8 hours straight through meals, wine and some post-party fun! The shade Fashion Legacy is an intense fiery red that’s perfect for Valentine’s Day and Kiss Day! Transform your lips instantly with this bright, bold irresistible red lipstick. Smashbox Always On Liquid Lipstick is a lightweight, pigmented formula that stays on for 8 hours without feathering and fraying! The formula is made using advanced polymers and primer oil that help boost wear time and don’t dry out your lips. The shade blast off is your perfect hot pink that’ll leave your man wanting more of that pucker! Pump up the romance with the Maybelline New York Superstay Matte Ink Liquid Lipstick in the shade Romantic. It’s your perfect pop of pink. It really lives up to its name and stays on through literally EVERYTHING! It’s going to get you through a lot of smooches and cooches, if you know what I mean. And at that price tag, I’d grab a few if I was you. Clinique Pop Lacquer Lip Colour And Primer - Go Go Pop! The Pop Lip Lacquer from Clinique comes built in with a primer to boost it’s wear time. The lipstick is ultra pigmented and lightweight. The formula dries down to a matte finish and doesn’t dry out lips. This one is absolutely perfect if you suffer from dry lips and still need a liquid lipstick that you can slay in, all say! This was a new addition to my vanity and my collection of these multiplied rather quickly! The formula and the wear time is absolutely unbelievable. This consistency is that of coloured water and it feels like absolutely nothing on your lips. The pigment stays on absolutely ALL DAY and won’t dry out your lips. You can wear it alone or under a lipstick for an added pop. It's your 'I woke up like this' lip colour! If you’re not a liquid lipstick person - DO try this! Oh and this one tastes like frosting! This Stila Lip and Cheek Stain has the perfect light pink hue. It’s not too overwhelming and you can use it to bring some life to your cheeks too! It’s a very subtle, understated lip colour that stays on all day! This one’s perfect for the girl who’s not too comfortable with bright lips! The Lollitint is the perfect orchid pink coloured lip and cheek stain. It’s lightweight and almost water-like and it’s extremely easy to build the pigmentation on this one. I absolutely love how natural this looks on the cheeks. If you’re a no make-up kinda gal, put this one on for your man and he’ll love the way you blush at everything he says! This one aptly called Stunna, is a stunning BOLD red lippie from Rihanna’s new beauty brand Fenty! This one promises to be the perfect red for EVERY single complexion. Put on a pout full of Stunna this Valentine’s Day for your man and watch him drool! The formula is lightweight, low maintenance and your best red lipstick yet. It’s extremely pigmented and stays on for 12 hours without fraying! We hope we’ve helped you narrow down your kiss day lipstick choices. Tell us which one was your favourite!